Even though for regular desert touring I’m not that positive about them in the old Sahara book [OLH2 has since replaced it], the opportunity came up to get some first-hand experience with a truck in the Sahara. Up to a point I’ve been here before; a deafening and costly experiment with a diesel Land Rover 101 in 1988 (right; an experience detailed excruciatingly in my Desert Travels book). Now (2006) for about the same price I have an M.A.N 8.136 (i.e. 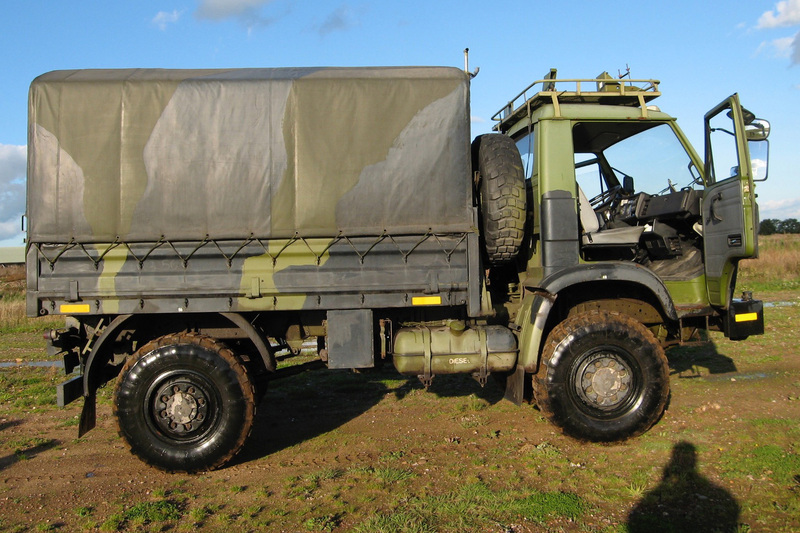 : 8 ton GVW with 136 hp). I spotted these a few months ago while going through a truck phase and was immediately drawn to the manageable size (driveable on a pre-1997 UK car license) if not the price. Jackson’s quoted £12,000; a place in Belgium and Denmark both asked about £9000 and later in 2009 I saw one advertised in the UK as a gunbus for nearly £18,000 plus tax! Back in 2006 I forgot about them until a couple of days before leaving for SEQ when Matt and I tracked down a much less expensive example just down the road at Leaversleys. We checked it out and after thinking it over I figured it was worth a gamble and told him to buy it as I set off for Mali. As far as I can tell an 8.136 is comparable with a Unimog 1300L, but was about 40% cheaper at the time and more conventional all round: a 5-speed/2-box/3 difflock trans with long leaf springs and with a similar 5.7 litre aspirated six, but with full time 4WD and as forward control as they get without falling out and running yourself over. 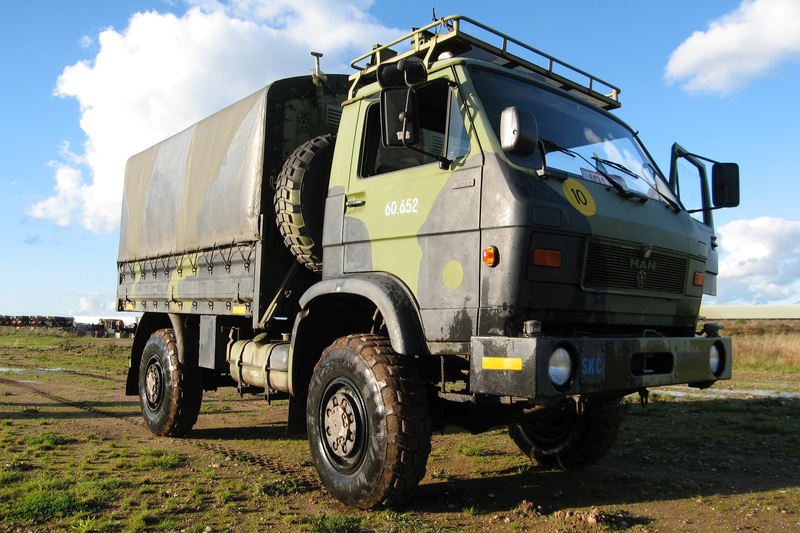 I hear that the 8.136 was a 1980s collaboration with VW for the Danish army (you may recognise the VW LT Transporter-ish cab). Luckily, since the Norsemen pillaged the Isle of Wight in AD 999, peace has reigned supreme and so these MANs have not been used much; many got given away to Iraq. Mine is about 1990 with a winterised radio suite in the back (above left; since removed) and with only 10,000km on the clock. It’s all a bit extravagant of course but my excuse was I needed a proper support vehicle for my upcoming 8-bike Algerian tour instead of making do with a station wagon with little or no capacity for broken bikes and riders. (This time, to save the long and boring road haul, I am delivering the bikes to Djanet while the riders fly in.) My VW Taro pickup was to sort of fill that role but of course is no more. There it is right, on the back of another MAN, a 19/240, and about to get even more wrecked. 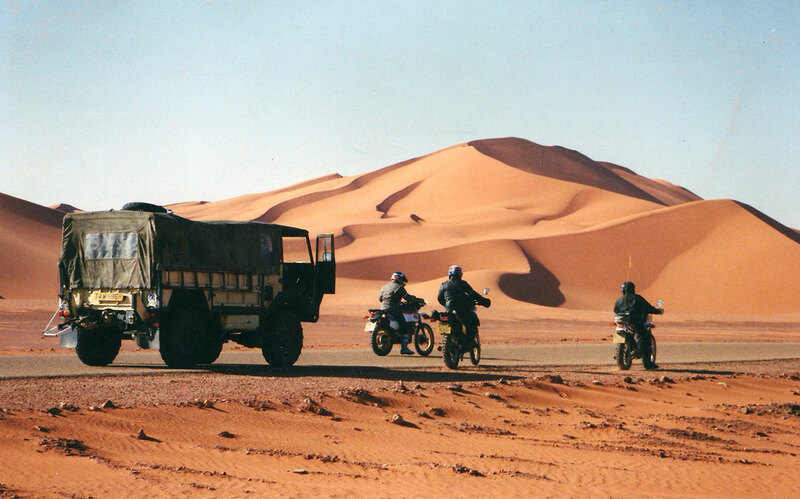 … and quit evidently, I like to truck, but for the moment I still stand by what I said in Sahara Overland. 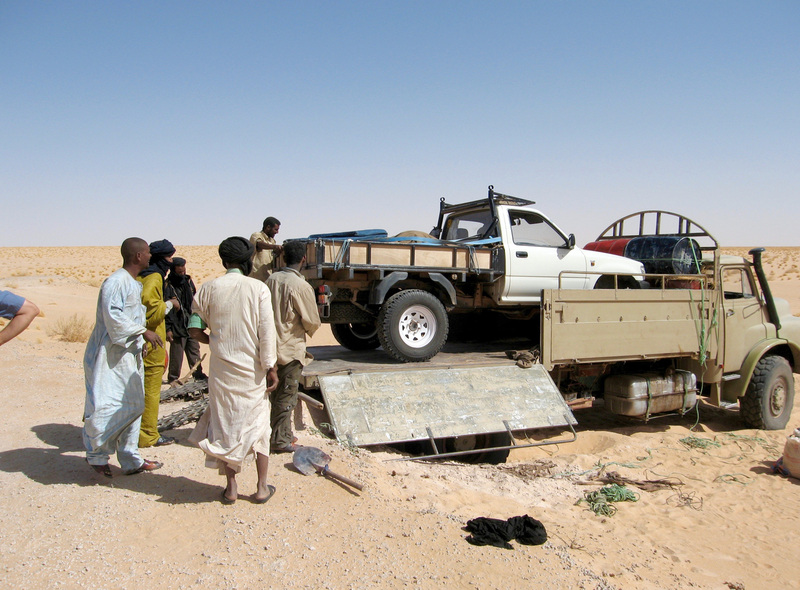 In the Sahara the only thing a truck can do is carry more, or offer a higher level of overnight comfort but at a cost to road speed and fuel economy (a reputed 3 kpl and 90kph with the MAN…), let alone all the other drawbacks listed on p.101. We proved on SEQ that (with one exception) a regular 4×4 car can manage a two-week/2000km off piste payload in the desert. Were it not for the bike tour offering the convenience of a vehicle to transport the bikes to the desert and support them while they are there, I would not have needed the MAN. So far Matt has managed to MoT it so all it needs now is registering (various options exist), repainting and other domestification as well as a check over. I went up to do some donkeywork. 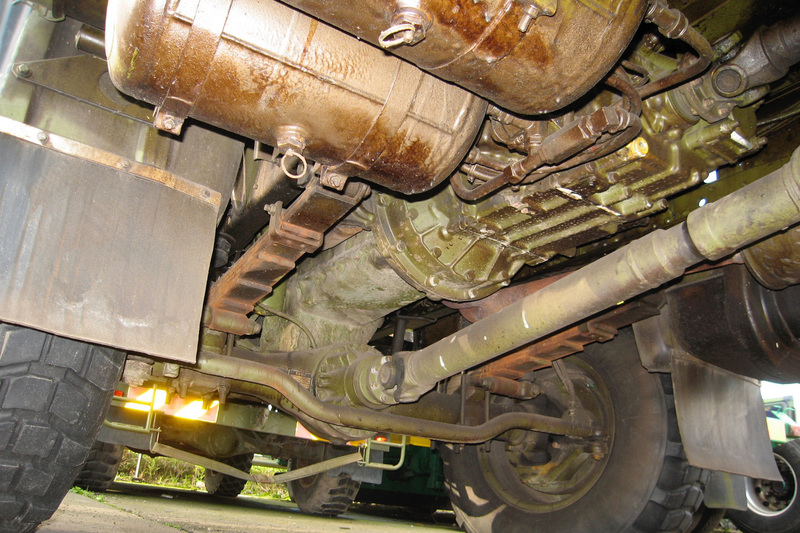 One good thing with trucks is there’s no back-busting grovelling underneath, as with cars; with the cab hinged up the motor is right there like a diner counter. You can imagine when they were designing it there was no great need to jam it all in, like a modern hatchback. Need a compressor? Stick it on the side of the engine; spare tyre? Lash it to a winch behind the cab. 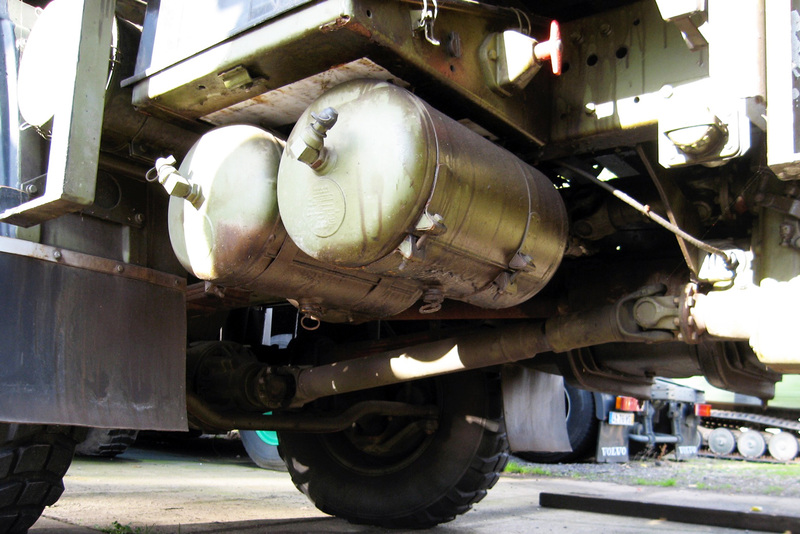 Airtanks, mysterious brackets, metal boxes the size of a small fridge? Bolt them to the chassis – aerodynamics be buggered! The motor oil looked fresh (it was demobed a year ago) so that’s 20 litres saved, the antifreeze looked OK too, but the four rubber belts powering various things were all changed after which I replaced the LHD headlights (Matt fitted RHDs for the MoT). 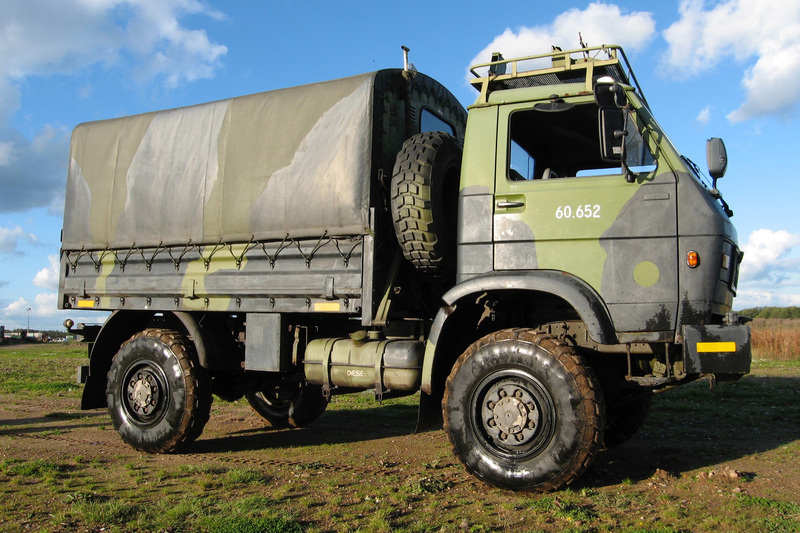 We may well have a go at the hoses too, thick with green camo paint. Even though the mileage is low, I believe it‘s best to replace all rubber components which age despite the kms. One thing soon became evident: the thing was covered from all undersides in a thick greasy gloop which has done a great service against Danish sea salt, but sure makes it messy to work on or even brush against. Next job prior to painting, off with the cab roof rack which weighs a ton (I’m getting used to it; everything does), and while up there unbolt more clamps, brackets and cabling – more scrap for the yard. Couldn’t get some NATO sand paint as used on my Merc 190, so we popped down to Paint-u-Like in Matlock and got 4 litres of like-coloured hue mixed off the colour card menu. When it warms up we’ll hand paint the lorry to save time and if it looks too rough do something neater when I get back from Algeria. Now I know Denmark is a small country but the fuel tank is a paltry 140 litres, enough for 500kms; twice that would be handy. Obviously a used lorry tank would be the go and the place we bought the MAN off was going to chuck one in. But they didn’t and the hassle in finding and fitting a possibly rusty and leaky right-sized giant item with only four shopping days left to Xmas made us decide on a rack of jerries. So it was off with the big metal box to remount in the gloop on the exhaust side and, shortly, on with four chunky MoD jerry racks from our good friends, Anchor Supplies and heck, why not, four new jerries for the first time in years. That will give me 220L or 770 clicks, still not enough, so I may well just get me an oil drum in Algeria once the bikes are out; there’s plenty of room. 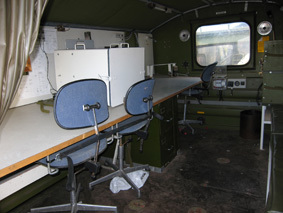 back of the shoulder-high deck without hernias or damage. With a shortage of trees to swing a pulley from, my instinctive solution was a scoffolding pipe A-frame hinging off the back corners – the way the ancient Egyptians used to erect their obelisks and a bit like a skip lorry lifting its skip. Another car pulling the rope and/or the MAN reversing with a tied off rope (so lifting the bike) was the plan. NIce, light and simple; you wonder why all delivery vans don’t do it that way. 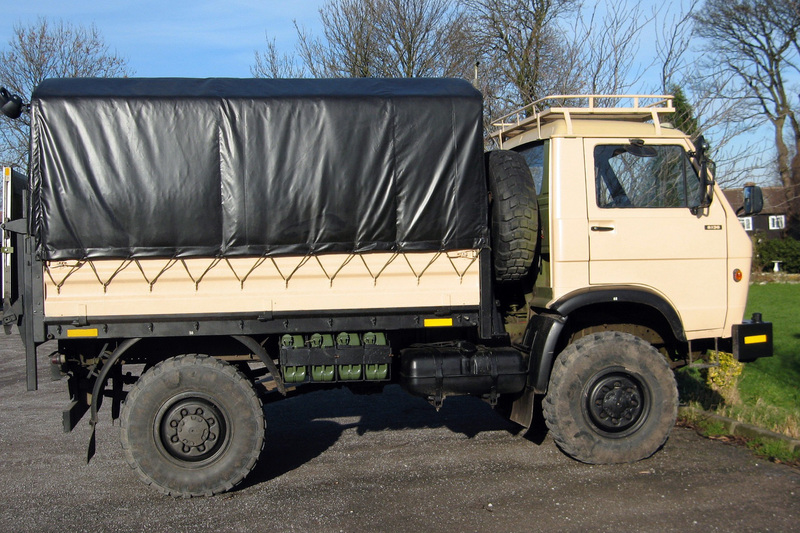 Matt liked the idea too until various operational flaws manifested themselves: ideally the A-frame needed to be not on the back corners but inboard a bit like a skip lorry – but the tarp and frame get in the way. Then Matt had the bright idea of an ex-lorry tail lift and sure enough, after a couple of weeks he located a nice one nearby off a 2002 Iveco at nearly the right width and for a couple of hundred quid. Sure it weighs a lot but lifts 500kg and anyway weight is one thing you don’t have to worry about too much with a truck. It’s unlikely to have any effect on performance and in the desert the MAN will be barely loaded anyway. Some recently acquired sandplates hooked on the back they’ll make a nifty ramp for rolling bikes on. As it is, none of the desert bikes weigh more than 200kg. Another benefit of the tail lift is a very handy variable height table (VHT). With only a couple of days before I leave for Algeria on a bike tour I’ve finally done a couple of hundred miles in the lorry and in a nutshell: it’s easier to drive than it looks. The whole lorry deal can be daunting if you’ve never done it before and every time I see it after a while I’ve thought “cripes, I can’t drive that thing safely“, but then again we all thought the same about cars and bikes once. Only difference is, we were young and carefree then! Fact is, you just need to remember it’s no wider than any other bus or lorry, and about as short as it gets, being only half-a-metre longer than Matt’s VX Tojo. Before I left Matlock we nipped down to Anchor for a tarp and strung it up over the uncovered back (mostly hidden by the tail lift), and then bolted a couple of pegs to the tail lift platform to keep the steps or sand plate/bike loading ramp in place. That tail lift is going to be a real boon; I just hope it lasts as the greased runners are exposed to dust and sand. At least if it packs up we’ll have enough of us to reload by hand. 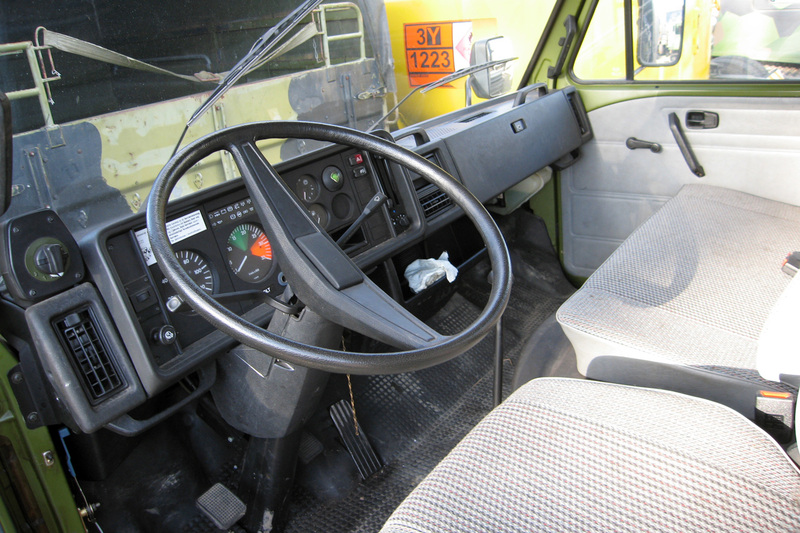 The lift platform has been locked out against the frame with a hinged hasp for off-roading and is switched on inside the cab to deter messing about. In the cab is also a switch for a back floodlight which has already proved useful for unloading and reloading bikes until they all jammed in with inches to spare. The auxiliary batts are new and now running a 24-volt inverter and 4-way cig jobby with a 12-volt dropper. Main batts are original but look OK. The 4-jerry rack on the fuel tank side now gives 220 litres or around 800kms. Most of what you can see is now a shade of sandy ‘blush’ with matt black trimmings. What’s all that smoke on the left? Is the Pope dead again? No, we were just playing with the back heater and wondering how it works other than on diesel and with a fan. A little metre indicates it’s clocked up 347 hours warming Danish cockles over the years which makes me think the MAN has not been as idle as it’s speedo indicates. Right now there is little use for this heater apart from stopping the bikes catching cold across France. It got flogged. Coming down the M1 I kept a close count of the vehicles I overtook topping out at around 2: a 12-axle mega-crane being escorted by vans with flashing lights; and a propane-powered roadsweeper that must have got lost on the way to the tip. The MAN sat steadily on 80 kph up all the grades and touched 90 when I wasn’t looking, but 80 seems fine. Engine is lovely and smooth like any six, it didn’t feel strained or crude or wander the lanes and was altogether a pleasant surprise. There are some great sound effects besides the roar of the 5.7 being gunned: there’s a superb whistle in the middle gears as zillions of cogs mesh about, and of course that squirrel-traumatising psssSHTTT as the air tanks blow off every time you touch the brakes. Steering feels good even on those knobbly tyres. Suspension is like any empty 4×4 with the edge taken off by the suspension seat. Cab noise is OK (Defender-ish levels – you can talk OK although it’s more rewarding if there’s someone else in the cab with you), and the cab heater could double up as a mobile beef jerky factory. For a full-time 4WD there virtually no drivetrain lash which is a relief – must be the low mileage. 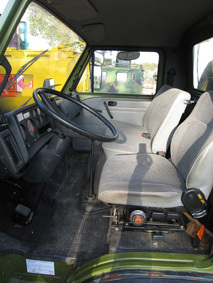 Only the air brakes take some getting used too – they lack the progressive feel of hydraulics and the potentially destructive momentum of the 4 or 5-ton brick is probably the most intimidating thing about driving it at the moment. Although the brakes are powerful enough to lock the tyres, all in all I’m quite pleased it will only do 80-90 max. Those Mich XL knobblies are not as bad as the squishy and slippery XSs they resemble. 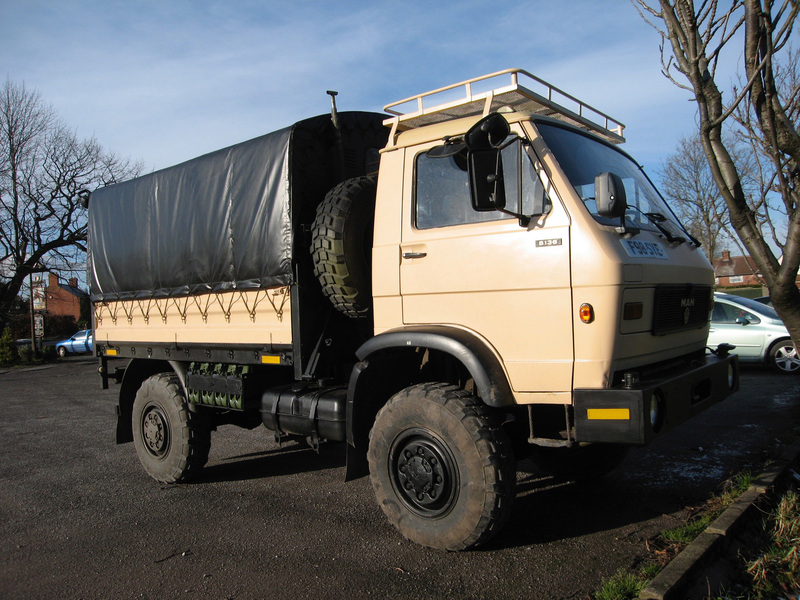 I did notice the overlanding lorries at the Adventure Show last weekend all ran my sort of tyres. I suppose the weight has a lot to do with it, but I would prefer normal XZY-type road tyres – and in the more widely-used (in Africa) 14″ size instead of the 12.5s it runs now. Here, they cost hundreds of pounds each of course, but I may be able to pick some up in Algeria. There is a faint hope 14s may raise the gearing and so top speed a notch, but it has to be said the gearing feels spot on right now; you pull away in 2nd and reach the long range of 5th asap. 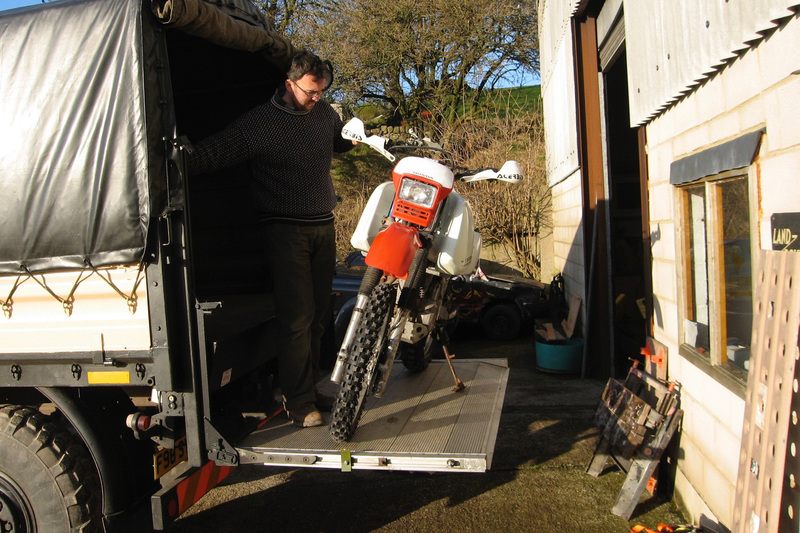 All this heavyduty gearsticking, ginger braking and clutch hauling, as well as the stress-of-the-new and even just getting in and out of the thing is tiring of course, so it’s a relief Matt is coming with to Marseille to share the load. Have you ever noticed the full array of mirrors lorries have? I thought it was just my MAN but now I see they all have 3 or 4 on the offside at varying angles and curvatures to see all sorts of angles, from the white line-indicating alongside the offside front tyre (nifty in the extreme) to blind spots in all directions. Very gratifying when things get tight. In town the lack of speed is not such a problem (in fact it isn’t anywhere) but besides all the rest, you also suddenly start paying attention to bridge heights, other lorry mirrors, too far out lamp posts and the like, as well as those red roadsigns with max permitted lorry weights. Luckily the 8136 is a ‘normal’ 7.5 ton size which gets into most streets while bringing with it a certain ‘Moses parting the Red Sea’ effect on traffic. All very nice while it lasts. And when you get it wrong the shortness is very handy and saves a lot of crushed walls.